The maxi “GEM” sewage treatment plant was intended to replace the septic tank / French drain system entirely in all areas not serviced by a municipal sewer. It was designed to be used in environmentally sensitive areas, or in areas where there is evidence of dolomite, clay, or decomposed granite. An anaerobic septic tank does not purify water to nearly the same quality as an aerobic process. We have widespread acceptance of the “GEM” from municipalities and building inspectors around the country. The standard domestic system consists of 4 tanks and can treat up to 3.000 litres of sewage and grey water per day. This is sufficient capacity to cater for up to 15 people on a daily basis. The 5, 6 and 8-tank models can handle 4.000, 5.000 and 6.000 litres per day respectively. For example, the 8-tank model, on a dual pipeline, can cater for 75 people per day, which makes it ideal for lodges or conference centres. 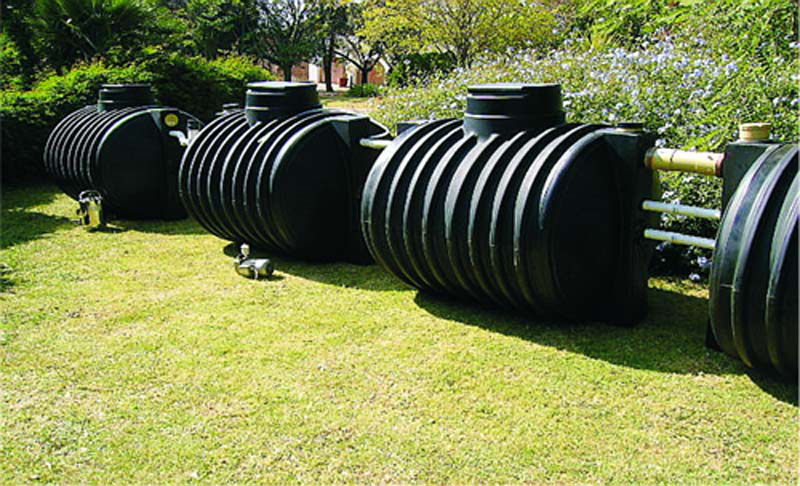 The Maxi “GEM” sewage treatment plant consists of 4 (5, 6 or 8) tanks which are buried to a depth of 1,2 metres so that only the manhole covers are visible. It incorporates an up-front anaerobic tank(s) with a specialised form of snubbing of the volumetric flow into the secondary anaerobic tank(s), with a special feature to accommodate a short-term overload in excess of 1.000 (2.000) litres in the primary tank(s). Thus, the effluent passing from the first to the second anaerobic tank becomes broken down almost to a silky-like fluid, on average, and then, final digestion takes place in the second tank before passing on to the aeration tank. The third, or aeration, tank also incorporates an airlift sludge return pump, whereby any sludge not finally digested is returned, in equal portions, to both the aeration tank and the second anaerobic tank. From the aeration tank, the effluent is passed through an in-line ozone generator before entering the fourth, or holding, tank. This tank incorporates a suitable submersible pump, equipped with a float switch. Although the effluent from the system is not purified to DWAF General Standards, it is nevertheless safe and may be used in a variety of applications such as irrigating lawns, gardens, flowers, shrubs, trees or crops. In many drier areas, users create an artificial wetland, which ultimately discharges into a pond. A big benefit of the sewage treatment system is that it does not pollute the underground water reserves and actually saves water, since each litre can be used at least twice. Click here for more information on the “GEM” onsite sewage treatment plant.